We have been very busy reviewing hebrew letters and vowels, learning hebrew words associated with the holidays, and beginning our unit on G’milut Chasadim, or acts of loving-kindness. We discussed all the ways, we as children already do things to help others. We wrote down what we’ve done and drew pictures of our good deeds. We also talked about one of the 7 Spiritual Values, “Derech Eretz” and wrote down names of people we know and admire, because of their good character. Check out our helping hands bulletin board in the hallway near the back entrance to RSNS! 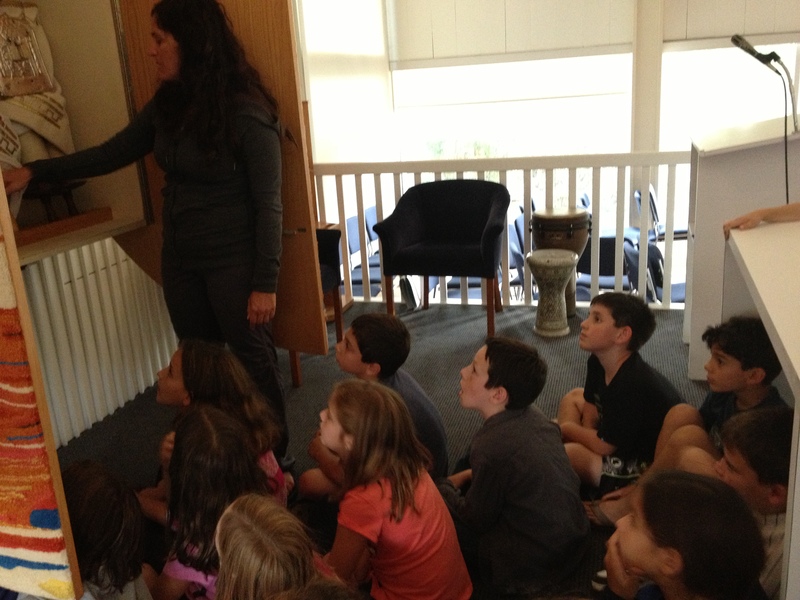 Gimmel class sees the Torah opened! We had a super time with Rabbi Jodie in the sanctuary viewing the Torah up close and opened. We talked about how we beautify the mitzvah of reading Torah by giving the Torah very beautiful crowns, belts and covers. The students had great questions about when they read Torah at their bar or bat mitzvah. They commented on the little ‘crowns’ on the actual Hebrew letters, and the spaces between the columns and words. In class we also discussed possible Tzedakah projects and voted on where to donate the Tzedakah funds. The first campaign will be for helping sick animals. We also talked about Derech Eretz, good character and being a mensch. Everyone was very happy that Brian brought a challah to share. Thank you Brian.